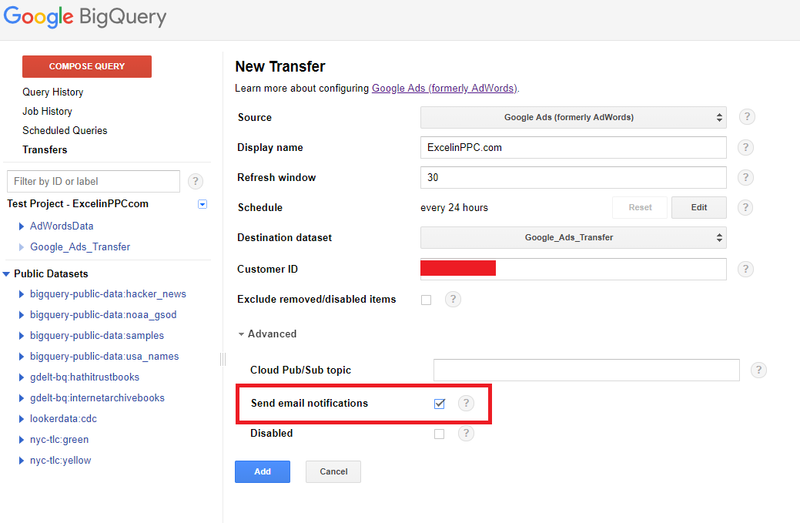 This article describes potential use cases of Google BigQuery for automating management of your Google Ads accounts. It’s based on 4 months of personal intensive experience. I don’t know everything but I know enough to share some thoughts and basic directions. Before deep diving into BigQuery, you have to know SQL If you don’t know SQL at the moment, you can at least learn what’s possible (and feel the need for learning SQL). So let’s get started. Why Should You Use BigQuery for PPC? 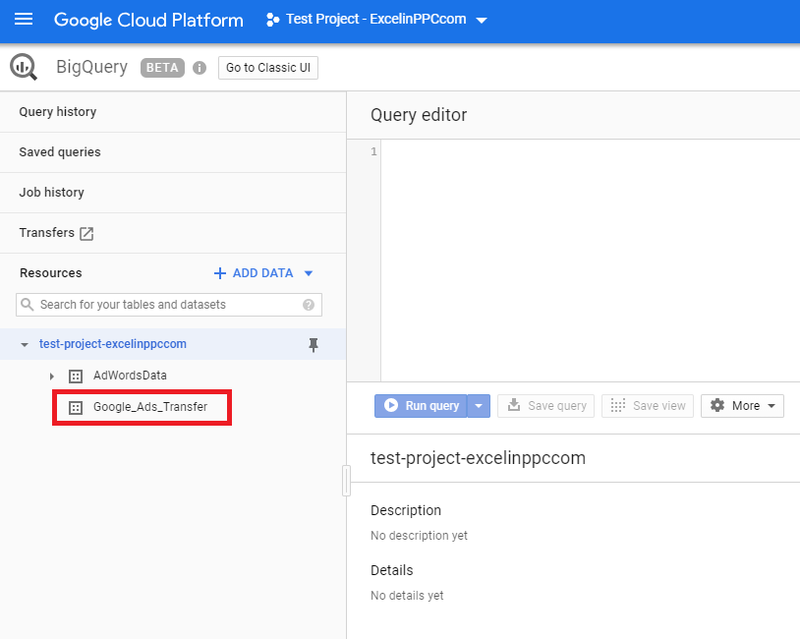 How to Setup a Project in Google Cloud Platform? How to Link BigQuery with Your Google Ads Accounts? What Do You See After Linking? How to Get Other Data to BigQuery? By now, you are probably asking what actually BigQuery is. BigQuery is “a module” inside Google Cloud Platform. Google’s definition is “Google BigQuery is an enterprise data warehouse that solves this problem by enabling super-fast SQL queries using the processing power of Google’s infrastructure. 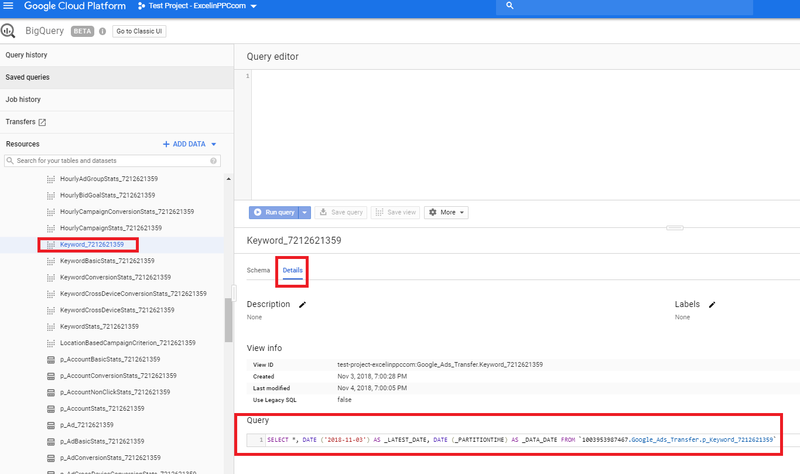 Simply move your data into BigQuery and let us handle the hard work.” Ok, so now we know BigQuery is powerful data warehouse against which you can run SQL queries. If you are frequent reader of this website, you know it’s been mainly dealing with Power Query/Power BI so far. Think about BigQuery as about more advanced “Power Query” which runs in Google’s server and is controlled purely by SQL. So basically, you offload all the processing to Google’s servers and operate everything through your web browser. You take the results of queries and load them back to Google Ads. The format is just set of “rows”. I am using word “powerhouse” in the title of this article. So let’s explain that. BigQuery can hold billions of rows so if you have huge accounts with millions of items (keywords, ads), you can easily this data in BigQuery while you would have hard time working with this data in Power Query in Excel. 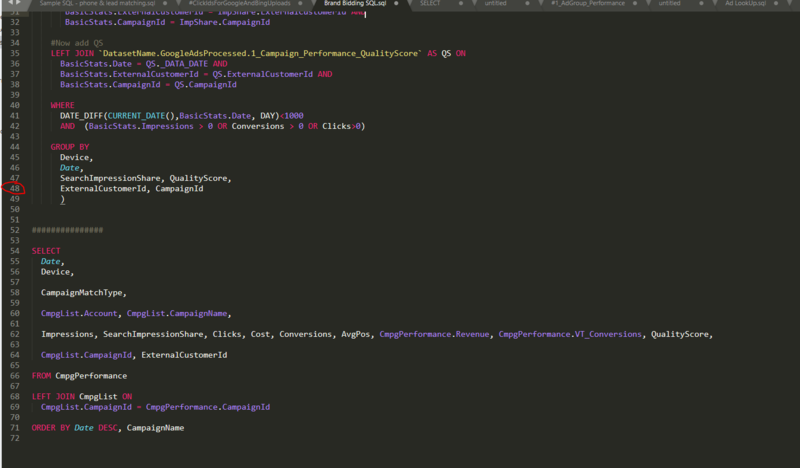 You would have 2 problems: even getting the data into Power Query and then querying it. So how long does it take to run a complex SQL query in BigQuery against, say, all 1,000,000 keywords in your accounts? You would be looking at 1 minutes, maybe 2 minutes. 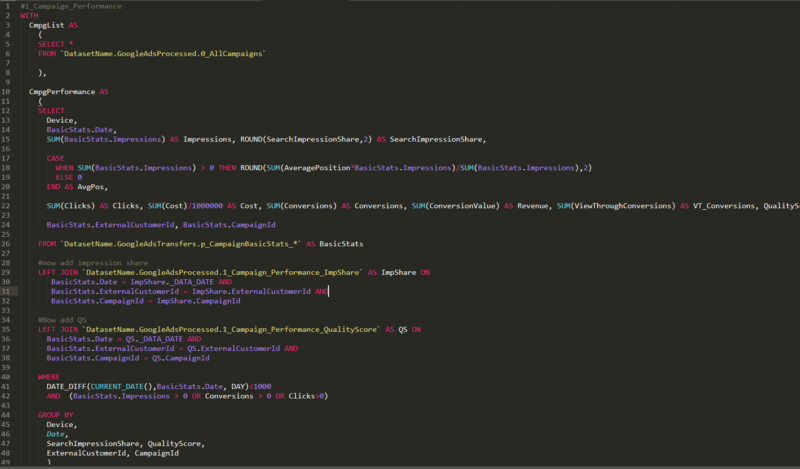 Super heavy queries with multiple joins run for about 5 minutes for me. Even queries in BigQuery can sometimes fail – that usually happens when you use too many ORDER BY clauses in your SQL. Remove them and you will be fine. Queries in BigQuery can run for max 2 hours. I have hit this limit once when I had an error in my SQL and all the rows were getting multiplied several times and the end result would several billion rows. 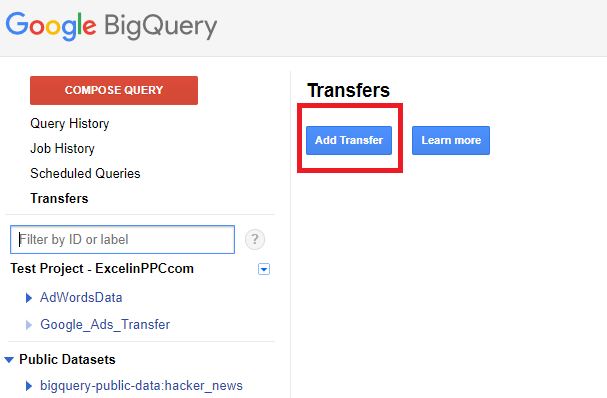 You pay for “data transfer” of your Google Ads account. You pay for every Google Ads customer ID. 1 account = 2 USD/per month. If you link your MCC to BigQuery which contains 10 accounts, you will pay 20 USD per month. You pay for running SQL queries however you can query 1 TB per month per project for free. Every extra TB costs $5 USD. I do exceed 1 TB in a big MCC which has many automation features in place pushed through BigQuery. You pay for storage – there is something like “active” and “long-term” storage. 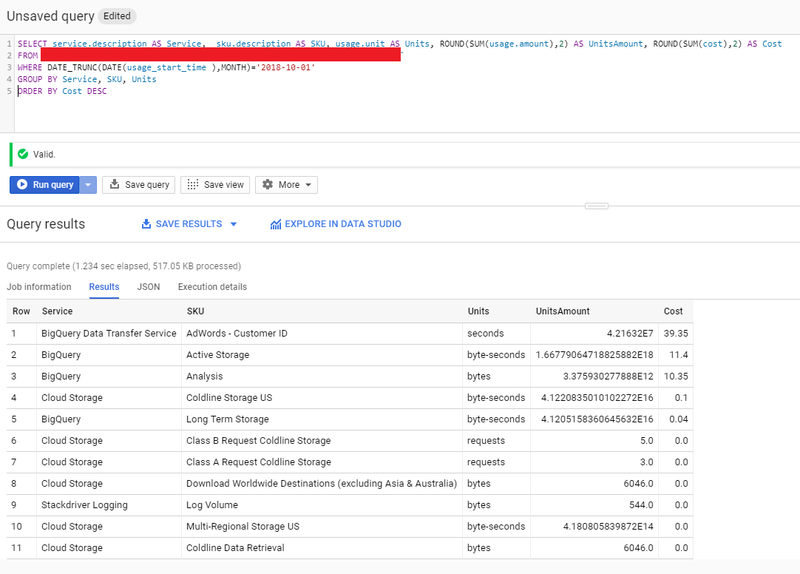 You can actually run SQL against all you operations in BigQuery to get exact cost per “BigQuery” SKU. You can see that I am paying almost 40 USD for my AdWords MCC linking (20 accounts in the MCC), then I pay $11 for active storage and then $10.35 for “Analysis” = querying the data. This means that I queried more than 2 TB in October 2018. The rest of the costs is close to 0 USD. Overall, I should be paying around 60 USD per month in this project, however, I paid only 48 USD in October. Why is that? Some Active Storage also comes for free every month. More details about pricing can be found here. So say 50 USD per month. Is it too expensive? No, it’s not. When you get to this level of spend in BigQuery, it likely means you are spending hundreds of thousands dollars in Google Ads so the cost of using BigQuery is really negligible. 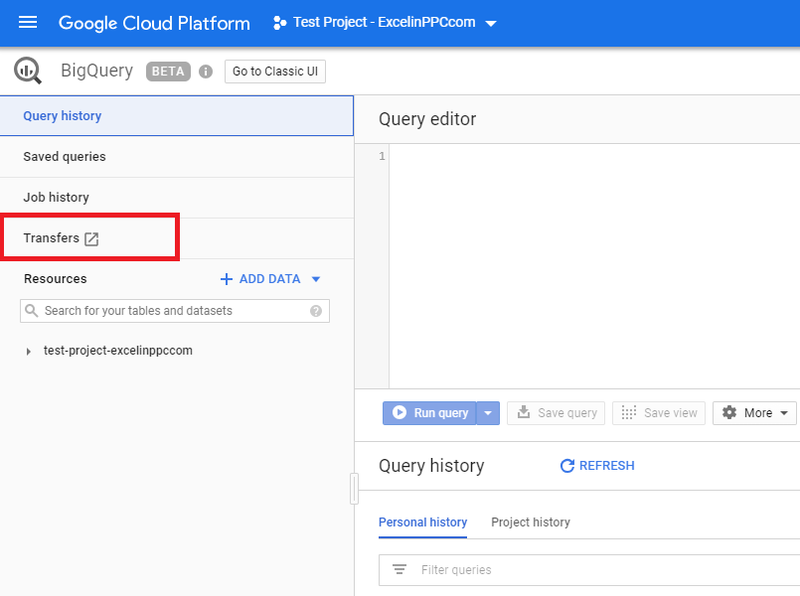 When you want to start using BigQuery, you need to setup your first Google Cloud Platform project. I will refer you to an older article where I describe how to setup your first Google Cloud Platform project. Read more here. 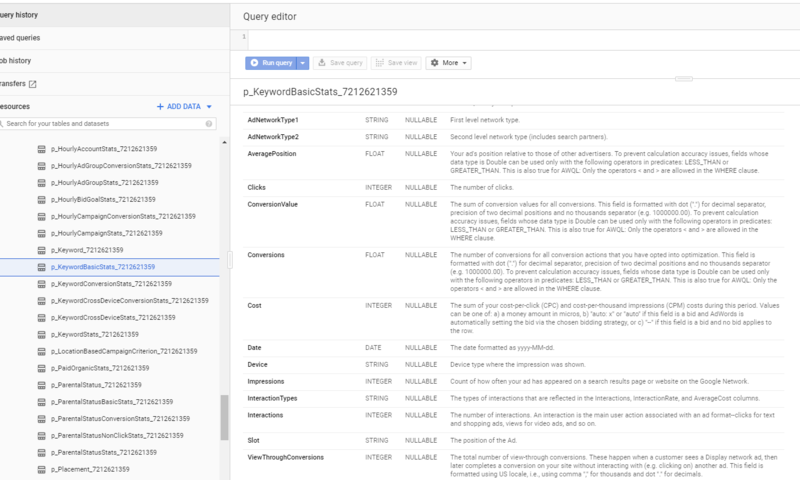 After you have your project ready and you finally get to BigQuery UI, it’s time to connect your Google Ads account. So let’s start. Fill out the parameters. Tip which can save you many headaches in future: always create datasets in the same locations across your project. If you have a table 1 in dataset A sitting in US and you want join a table 2 from dataset B sitting in EU, you will not be able to do it and you cannot change the locations AFTER you save the dataset. You can only query tables in datasets in the same location. Set “Never’ in Default table expiration. Press Create dataset. Enter some user friendly name of the transfer – you can change it later. Setup your refresh windows. Max is 30 days, use 30. It’s the best option. 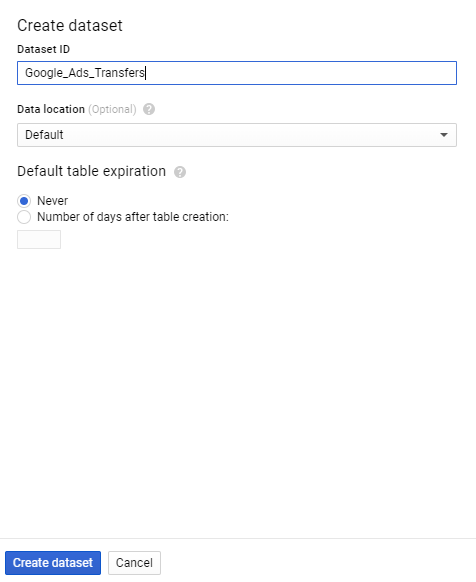 Latent conversions are assigned back to the date of the last click (not date of happening), this setting makes sure that even 30 days old data will be up to date because BigQuery will always reload the last 30 days of data. Setup schedule to 24 hours. You can do it less frequently but I don’t see any reason to do it less than once a day. Select your destination dataset which you created few minutes ago. Enter you Google Ads customer ID. You can enter enter either 1111111111 or 111-111-1111 format. You can enter your MCC ID and all accounts in that MCC will get downloaded OR you can enter ID of an single account. It’s up to you. 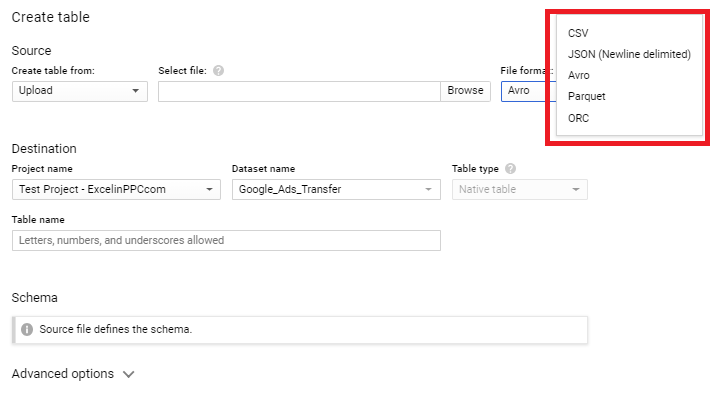 If you are running an MCC but you only need 2 accounts from that MCC to be transferred to BigQuery, you can either create separate dataset for each Google Ads account and separate transfers OR you can create 2 transfers but load all the data into 1 dataset. Click “Advanced” and enable “Send email notifications” – you will get an email if a data load fails. Press “Add” button and wait 5 minutes. In case your prompted for account details in a pop up window, go ahead and enter them + allow access for BigQuery to Google Ads. At the bottom you will see all the days of data which are currently being transfered to BigQuery. At this point, you are probably wondering which Google Ads reports are being send to BigQuery? All of them + all the columns :). That’s the beauty. You will have all available Google Ads data sitting in BigQuery ready for your SQL magic! 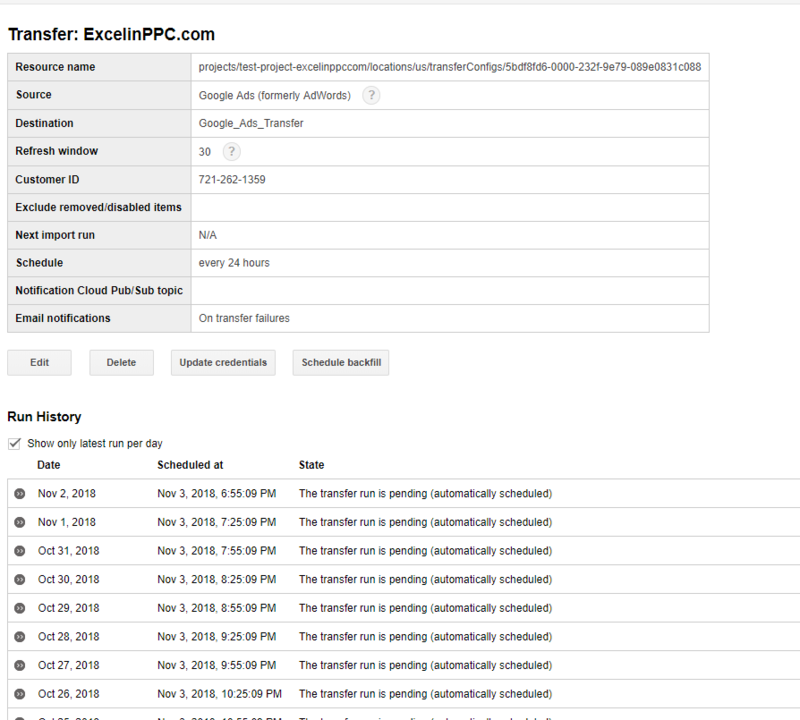 If you want to get even historical Google Ads data, you can schedule backfill (max for 1 run is 180 days, so you have to repeat the backfills manually if you have several years of data). 1 day of data can take up to an hour to be transferred, so you have to be patient at the beginning. 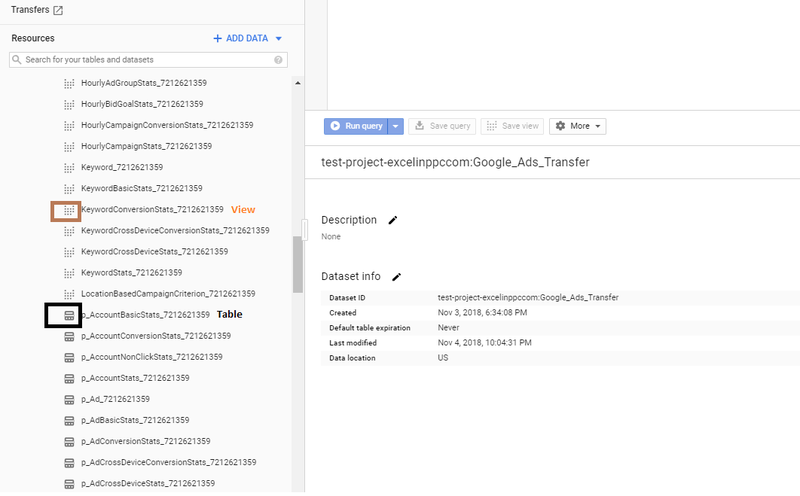 As a side note, I should also mention that there is a Google Ads script (It’s called BigQuery Exporter) which exports only selected reports to BigQuery and not all the reports unlike the “transfer setup”. The problem of BigQuery Exporter script is that it’s not very reliable (it can fail for no reason), it can run only for 30 minutes like any other script, it does not have and refresh window, and overall it’s just bad choice. The positive thing is that it’s for free no matter how many accounts you have and it will give you user friendly reports from the very beginning. If you are interested in using BigQuery Exporter script, read more here. You will see hundreds of view and tables. What’s the difference between view and table? “View” is presaved SQL query of underlying tables. When you want to preview “view”, you need to run the query itself. When you want to preview the tables, you just click preview button and see what’s inside. You can see that the views always add a new column “_LATEST_DATE” with yesterday’s date (the snapshots were taken on 2018-11-04) on the top of the underlying table of the similar name. When the underlying table is called “DatasetName.p_Keyword_ACCOUNTID”, the view will be called “DatasetName.Keyword_ACCOUNTID” without the “_p”. (I am not showing “preview” because my sample account in Google Ads has not data). You can also see “Schema” of the table showing what each column in the table means. And in order to create even more mess, performance data is spilled across multiple “stats” tables – so you have “BasicStats”,”ConversionStats”,”CrossDeviceStats” and so on. I will not be getting into more details since this is topic for 10 articles alone. 🙂 When I am trying to say here is that getting some meaningful data for the very first time can look as impossible task. You can use Google Sheet as table (only sheet from the spreadsheet though) or you can use CSV stored in your Google Drive. So for example, if you input some manual data in daily basis and you want to pass it to BigQuery, the best option is definitely Google Sheets. 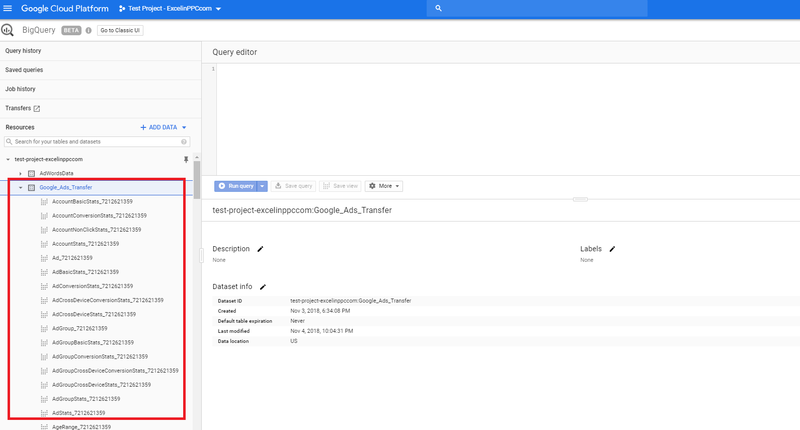 BigQuery also has its own API through which you can upload your custom data (say, data from Facebook, data from Bing Ads, data from your CRM etc.). These integration are not as straightforward as “clickable” options in the UI. You need to write a custom piece of code and run it on your server on regular basis in order to pass the fresh data to BigQuery. In case you need help with custom data, we have already developed our own proprietary solutions for few clients (Facebook, Bing, custom CRM integrations, loading multiple sheets from Google Sheets spreadsheet). You can contact us for more info. The highlighted buttons allow you to save query as view OR save results as table. You can see that creating very basis performance looks frightening but don’t worry – once you’ll get past your first project, you will get used to it and what’s more – you can just copy the views between the project and change only account IDs and dataset names. So after you create your account, campaign, ad group, keyword, ad performance views, you can move to next phase – to running custom queries – which will help you automate your Google Ads account. 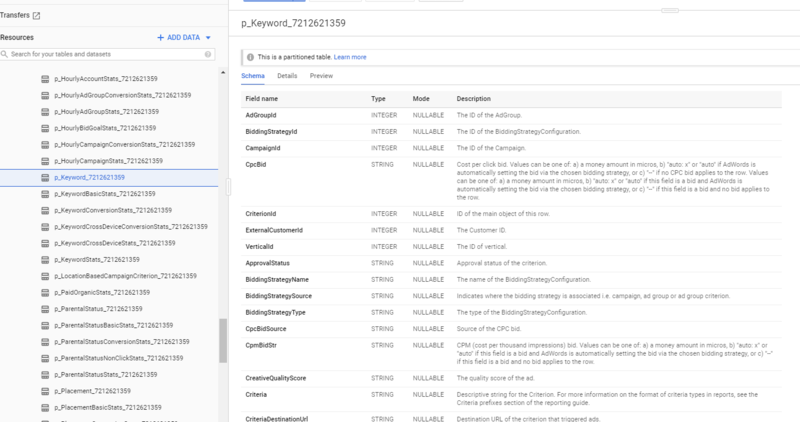 Complete build out of search campaign structure based on “feed” of inputs stored in Google Sheets – we had to employ SQL and BigQuery’s performance since we had to generate around 3M keywords, hundreds of thousands of custom ads, everything based on super custom rules. If new items appear into our feed, we can easily generate campaigns, keywords, ads with few clicks (we could send all this new content automatically to Google Ads if wanted to). Automatically adding good search terms as new keywords (if your campaign structure allows). Automatically adding bad search terms as new negative keywords. Pausing/activating keywords based on the content on your website – for this exercise, we have build custom crawler running on daily basis through client’s page collecting information about his offering. We then pair this crawled data with Final URLs in Google Ads. If certain conditions are met, we pause/activate keywords. Creating custom bidding strategies by combining Average Position AND Impression Share. Creating custom bidding strategy which makes sure your account don’t run too hot or cold on our monthly budget. Various checks for empty ad groups (no KWs, no Ads). Check for duplicate items (ads, keywords). Custom conversion uploads based on the combination of Google Ads data (gclids) and data stored in client’s CRM – handy for clients when you want to upload only good leads and not “all leads”. Obviously, showing exact steps and SQL code for samples 1-12 would results in 12 articles if similar length like this one – I am not going to do that, I just want to give some inspiration of what’s possible. On the top of performing various automation tasks, BigQuery is super useful for doing custom very data heavy reports – e. g. when you need to prepare location analysis involving millions of rows, BigQuery will have no troubles processing such volume of data. How to Get Data from BigQuery Back to Google Ads? 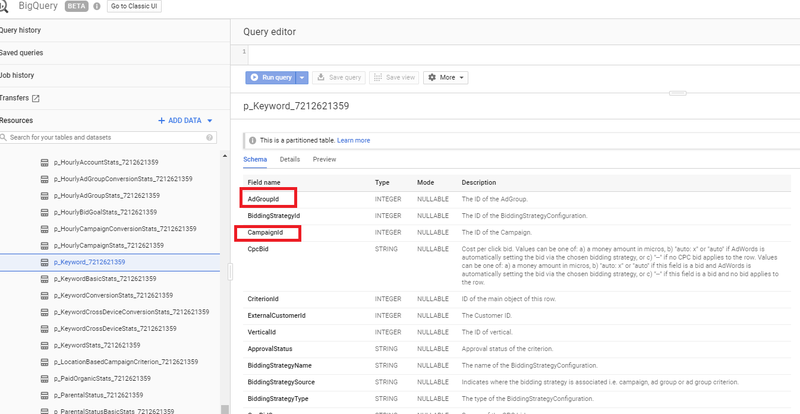 The final step – you have your queries in BigQuery ready and you need to get the results into Google Ads. How to achieve that? You can take multiple routes. The query returns action, campaign, ad group, keyword, match type, changed max cpc, campaign id, ad group id columns and now you need to push these results into Google Ads. Load formatted data to Google Sheets via Supermetrics for Google Sheets. The guys from Supermetrics have build BigQuery connector which allows you schedule your queries. 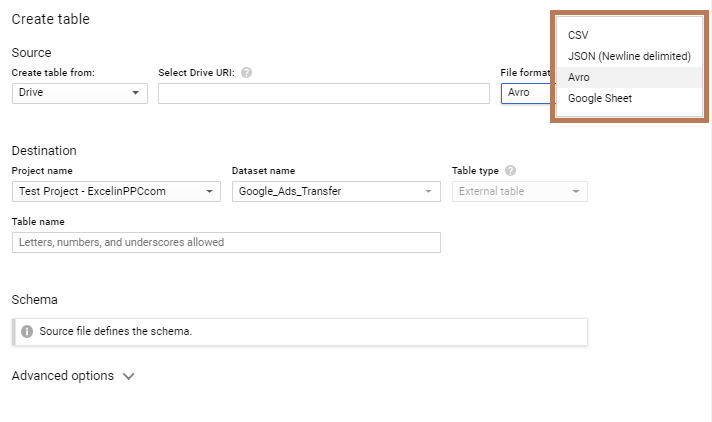 Use Google Ads script to pull data from Google Sheets and apply the data as “Bulk Upload” (or upload involving iterators in Google Ads). The sample screen above is suitable to be uploaded via “Bulk Upload”. 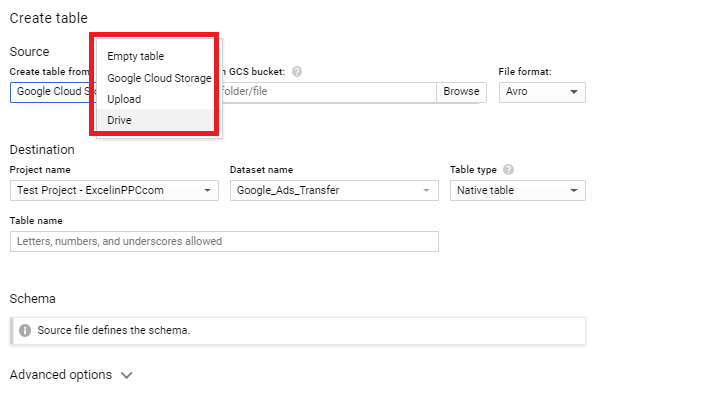 Scenario 1 allows you to doublecheck the results of your queries in Google Sheets whenever you want but you may hit Google Sheets limits if you try to load too many rows from BigQuery into Google Sheets. Apply the results of your queries immediately as Bulk Upload in Google Ads with our custom Google Ads script. Googel Ads script for this approach can be downloaded here. When you open the script, I recommend you to read through the comments in the code. Bulk Upload is quite underused approach to make changes in Google Ads – you can change hundreds of thousands items within upload of 1 csv file – something you cannot do with regular scripts involving iterators. On the other hand, the numbers of elements which can be changed via Bulk Uploads is limited. Read more about supported entities here. If you need a custom script (e. g. to change campaign locations which are not supported by Bulk Uploads) to upload results of BigQuery queries into Google Ads, contact us for more info. You schedule the entire process so it runs over and over and over by scheduling your Google Ads scripts & Supermetrics queries. I do realize this was a very long article, I tried to give you an idea about BigQuery can do & how difficult it’s to setup and what obstacles you will face on the way. 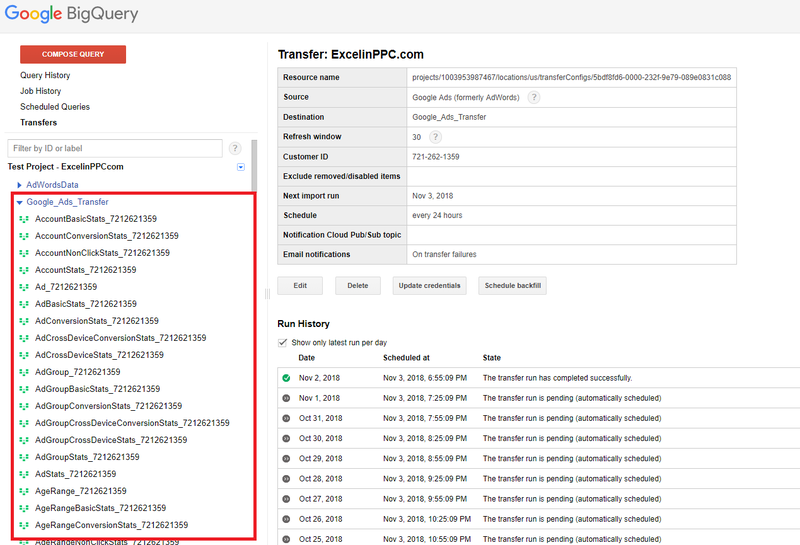 BigQuery converted into PPC automation tool is not for everybody and not that many people actually know about it. It requires SQL skills, little knowledge of Google Ads scripts, quite lengthy initial learning curve and not so easy setup process. On the other, once you master the basics, extreme processing power of BigQuery can deliver results which Google Ads scripts simply cannot achieve in case of very big accounts due to the limits. Thanks for posting so much valuable content. I sometimes have script which are longer than 30mn and also have some problematics when trying to analyse ngram for 2 millions of search terms. About this last need, I tried your ngram analyser with Excel, but Excel didn’t succeed to manage so much data. Do you think ngram analyse is possible with Big Query and with the same facility as with Excel ? yes it’s possible but it’s not as trivial as in Excel. I have done it already quite some time ago, it was probably even more than 2M search terms. This is what im looking for severall months/years. So valueable! Thanks for sharing this!!! !